NBS indicates that the increase is largely due to the high demand for natural gas for power generation at the Kinyerezi I power plant in Tanzania, inaugurated in Q4 2015. Total electricity generation in Tanzania increased by 12.3% only, from 1,559m kWh to 1,751m kWh, due to a decrease in the quantity of power produced from thermal and hydro sources. 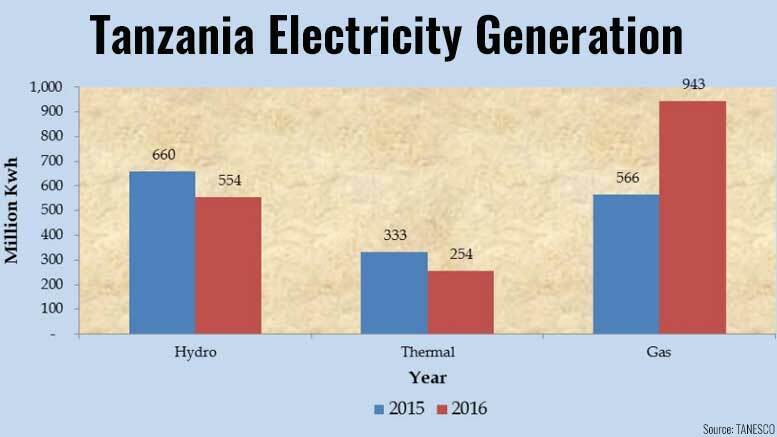 The report also notes that in Q2 2016, electricity generated in Tanzania using gas accounted for 55.7%, using hydro for 40.3% and using thermal sources for 4%. Tanzania’s natural gas production rose by 45%, from 7,793m standard cubic feet per day (MMSCFD) in Q2 2015 to 11,267 MMSCFD in the corresponding period of 2016. The recent discoveries of 55.08tn cubic feet of natural gas reserves off the coast of Tanzania have put the country on the world energy map. The Tanzania Petroleum Development Corporation (TPDC) estimates that the country’s gas fields are large enough to cover the domestic power requirements and make Tanzania the next natural gas hub in Africa.